The medical students were examining the reproductive organs of their cadaver when Sam Hodge told them a story. A woman had wanted a hysterectomy, was nervous about the surgery, so the doctor videoed it. As the patient watched later, she saw the surgeon had burned the emblem of his favorite sport’s team into her uterus. Was the doctor, Sam asked the students, guilty of battery? Sam Hodge, 66, happens to be a legal studies professor at Temple for 40 years who has taught Anatomy for Litigators and Forensic Medicine and Law. He bonded with one table of six students. As they learned the 27 bones of the hand or the 12 cranial nerves or the reproductive organs, he posed questions like the one about the uterus. The answer was not liable! The surgeon had to mark the uterus before removing it, Sam explained, and he happened to be a huge Kentucky basketball fan, so he carved a UK. Every day, they huddled around their stainless steel dissecting table, Sam in a white lab coat and the students in their blue scrubs. They looked him up, realized he’d written six medical books and lectured all over the country. They tried to call him Mr. Hodge. And every day, he seemed to add something wonderful. When a pillow is used to suffocate someone, Sam added, the result is often red marks on the face, called petechiae. When you spend all your waking hours trying to identify and memorize things like the torus tubarius and the salpingopharyngeal fold that extends from it, learning about what medical examiners look for in murder cases adds a little spice. “Sam is the best,” said Madeline Amberge, another student. Since students were the ones being tested, they did most of the actual dissection. But Sam was always hands on. When they were sawing through the pelvis, separating one leg from the body, Sam helped cut through the bones and soft tissues. Sam, as the students had done, sawed through the top of the skull. “Zach and I both noticed he was a little aggressive,” recalled student Michael Rockman, flashing a smile. “He completely loved it,” said Zach. 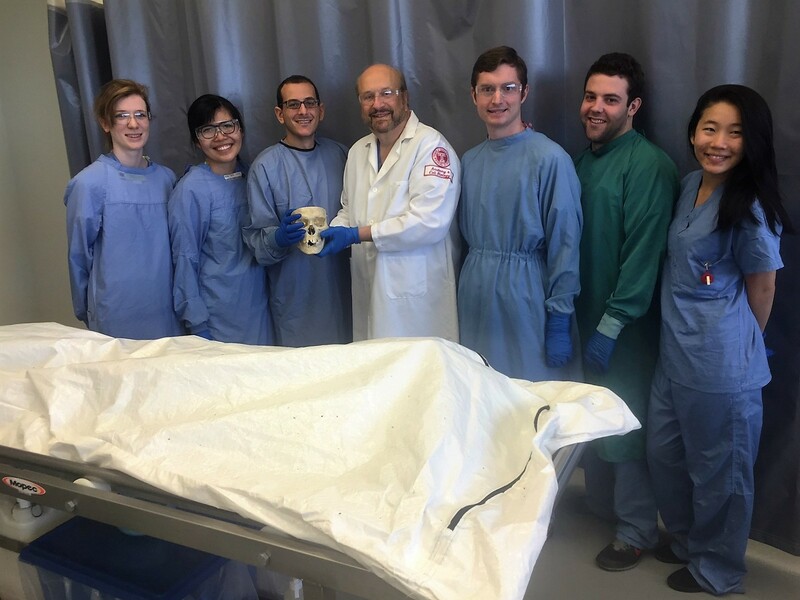 Sam loved everything about the class, the nuances and intricacies of the human anatomy, and the friendships he formed with the medical students. The students felt the same way. Lewis Katz School of Medicine at Temple University. Exceptional students, clinicians and researchers with zeal for education, research and patient care. Led by Pulitzer Prize-winning journalist Michael Vitez, Temple’s Narrative Medicine Program focuses on the human side of medicine through a celebration of and emphasis on stories and storytelling.